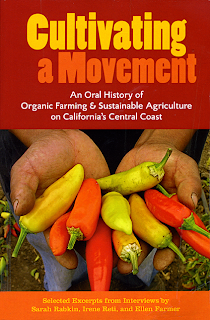 "Cultivating a Movement: An Oral History of the Organic Farming & Sustainable Agriculture on California’s Central Coast"
We are blessed with a generous growing season around the CA Central Coast, as well as a wealth of progressive thinkers and activists. So it’s natural that the Santa Cruz area, like certain other areas in the US, became a hotbed for development of organic farming and sustainable agriculture. Since the 1960s, local interest in political activism, research, and education, as well as organic farming itself, has helped to make organic farming and sustainable production practical for farmers and appealing for consumers throughout the US. "Cultivating a Movement" chronicles this process of popularizing organic and sustainable agriculture by interviewing contributors to the movement from many backgrounds and walks of life. 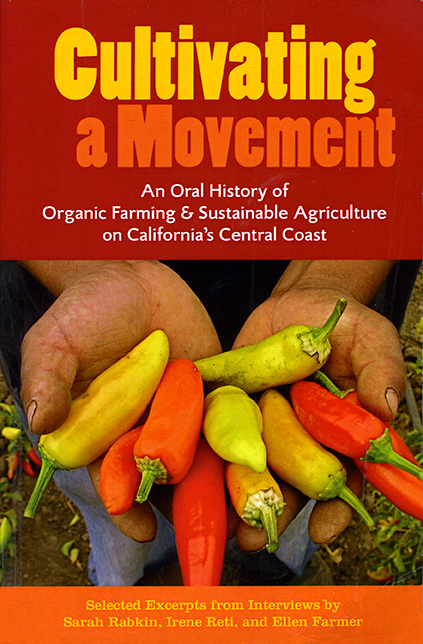 This volume is excerpted from a ten-volume set of transcribed oral histories on organic and sustainable farming. In turn, these ten volumes are part of University of California Santa Cruz (UCSC) Library’s ambitious Regional History Project, in which librarians are interviewing hundreds of Central Coast area movers and shakers, recording and transcribing their stories. Editor Irene Reti chose 27 (out of 58) stories to represent different aspects of the movement towards chemical-free farming that is sustainable and supports farmers and farmworkers in a socially responsible way. She includes a variety of farmers, educators in the fields and in the classrooms both on farms and at UCSC, politicians and activists who wrote and supported legislation, researchers working on non-chemical alternatives, farmworkers who have transitioned to farmers of their own land, and more. Individually, each person speaks in his or her own voice, focusing upon their experiences and expertise. Collectively these personal stories tell the history of how “organic” became a legally defined term and how raising organic, sustainably farmed produce became a viable industry serving popular demand. The book is well-paced, and related stories follow one another in logical sequence, carrying the reader from the roots of the movement up to the present. Being a series of short reads, it’s easy for busy people to enjoy. the first organic farmer to sign a labor contract with United Farm Workers (UFW), providing health insurance, holiday and vacation pay, and low cost housing to workers. the political hero who authored the California Organic Foods Act (COFA), giving legal definition to the word “organic,” during his first term in office. This was used as a model for establishing federal "organic" standards. the activists who worked “on the outside” to interest voters in COFA. the author of the 1976 book "Radical Agriculture," who founded the Environmental Horticulture department at Cabrillo Community College. the pure foods advocate who founded Santa Cruz farmers markets to rejuvenate downtown after the devastating 1989 earthquake, developing strategies to optimize consumer experience and reduce vendor competition. the largest organic herb grower in the US, whose early pesticide-related illness led him to organic production. the entomologist who develops a series of biological controls that made organic strawberry production viable. Conventional strawberry production is notorious for making farmworkers sick due to toxicity of pesticides used. the person who wanted to farm but studied agronomy instead because farming was dying out in his rural community. After developing the Small Farm Education Program (PEPA), he started a foundation to restore farming in rural areas like where he grew up. the farmer who started his “customizable box” CSA by advertising on craigslist. If you like organics and are historically inclined, or simply enjoy stories of everyday people who overcome incredible odds to succeed, read this book. It will make composting, weeding your garden, or even going to the farmers market after a busy day seem easier. You might even find new sources for organic produce, plan a family visit to a farm, or be inspired to support political action for sustainable agriculture. Organic farming helpful in social, economic and environmental aspects. Organic farming helps to sustain health of soils. Use of locally available resources is the highlight of organic farming. Documentary “Farming Our Future” tells the ill effects of chemical farming and the role of organic farming in the creation of a healthy world. Thanks for sharing your excellent video, Rewati. It's great to see organic farming becoming more popular in Kerala (India) as well as the US.